There’s an increasing desire for us to return to the earth, get our hands in the soil, and learn the food-growing skills of generations past. 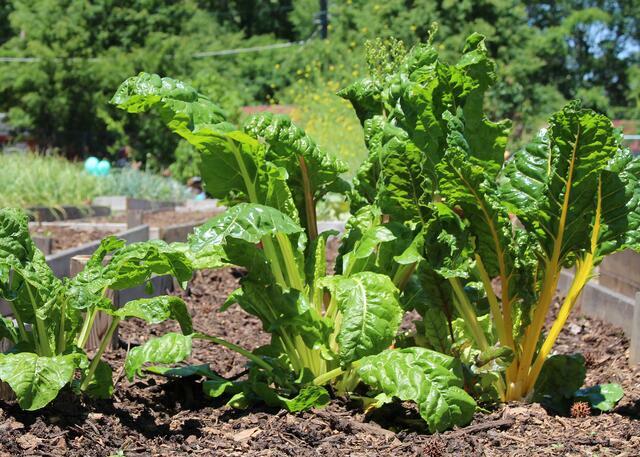 That’s why we hosted the first Soil3 Garden Show with a focus on edible gardening. 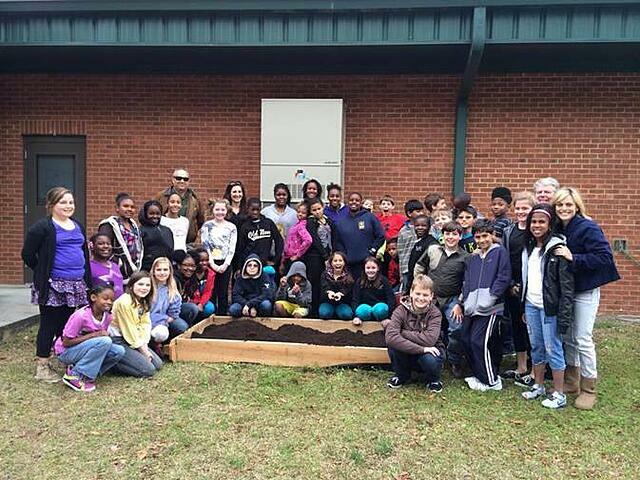 Our goal at Soil3 is to help others realize their gardening potential, not only through providing superior quality organic soil but through education. 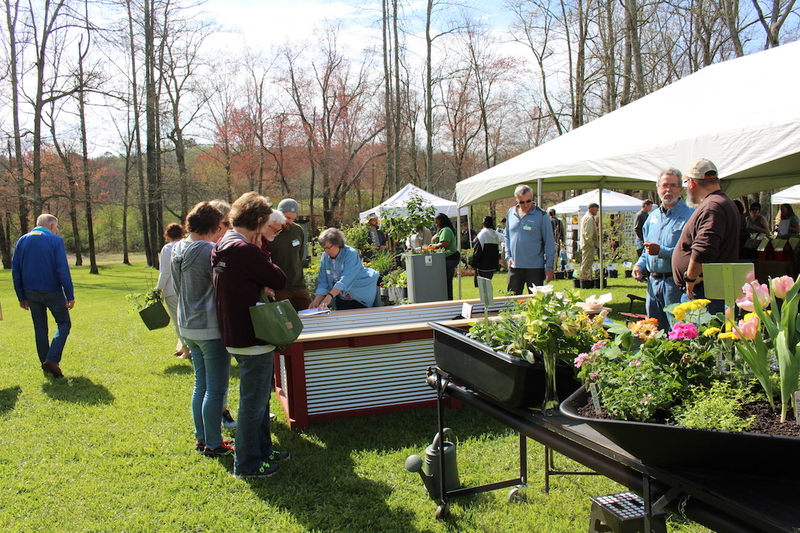 In order to give both experienced and beginner gardeners new ideas, one focal point of the Garden Show was a raised bed garden competition centered on the edible gardening theme. We awarded prizes to all of our garden builders, and we’ve listed them here, along with pictures of each of their designs. 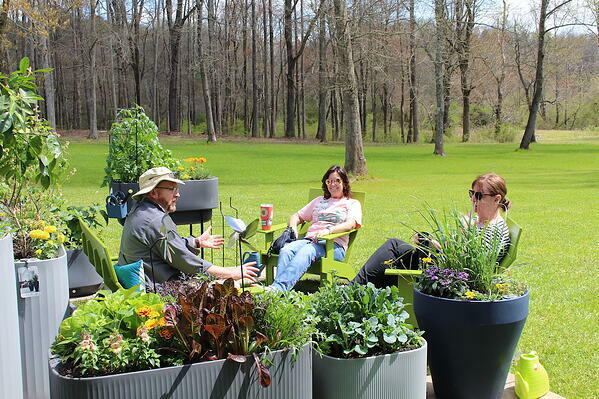 Peter Calabrese is a sales representative for Crescent Garden, an innovative company that seeks to bridge design and functionality in each of their container garden designs. But Peter is a passionate horticulturist at heart. 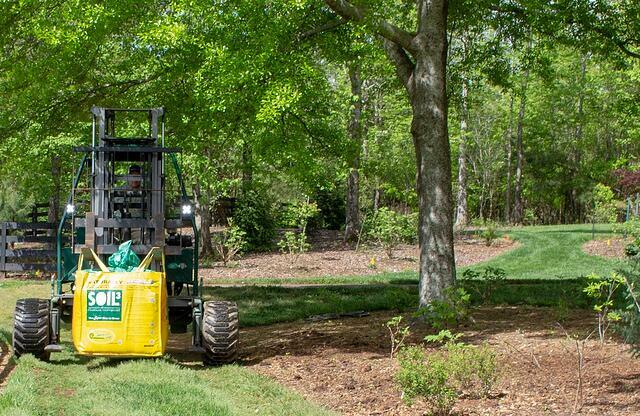 He’s constantly testing out different plant varieties and soil mixes to see what works best. 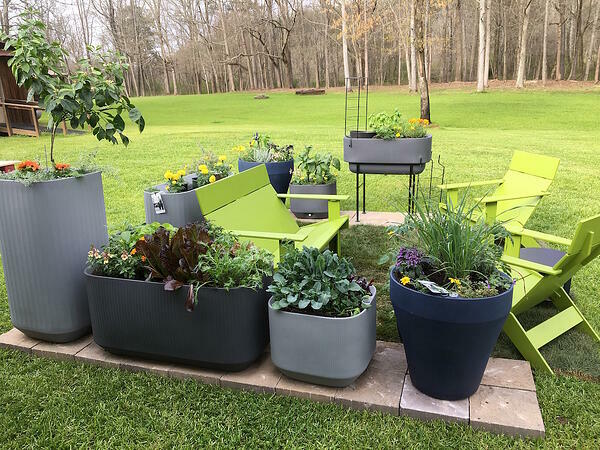 Peter combined his two worlds at the garden show by using TruDrop self-watering containers and Mod stackable planters along with edible plants he grew in Soil3. Peter displayed just how easy it is to create an edible garden with diverse plants in a patio garden, complete with bricks and even a sitting area! Judges agreed that Peter’s patio garden was ideal for growing food crops in containers and his design offered solutions for people renting or in condos with limited garden space, like only a balcony or a patio for garden space. His execution of the edible gardening theme was flawless, and the Crescent containers were of top-notch quality. 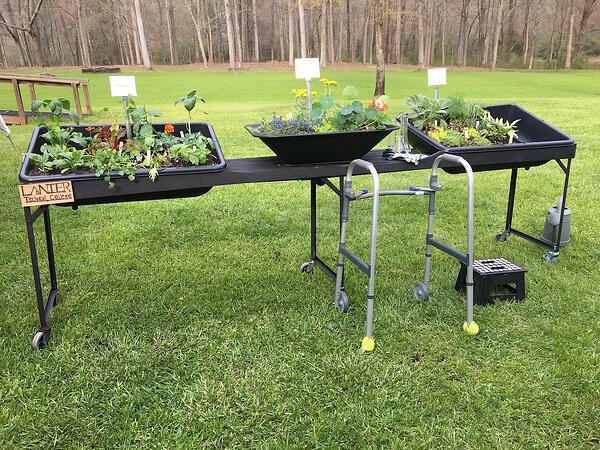 Lanier Technical College horticulture students combined forces to design a one-of-a-kind handicap-accessible raised garden bed as their submission. 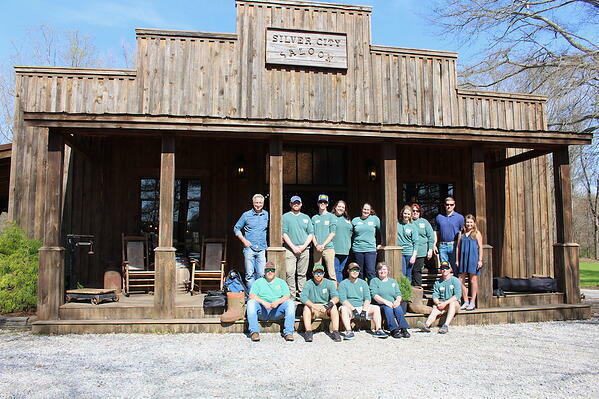 Students in Gary Love’s horticulture class began with the idea for a handicap-accessible garden easily maneuvered by a person unable to bend down beside a traditional raised bed. This idea blossomed into so much more as they combined forces and passions! The class first tackled the problem of providing drainage so water wouldn’t leak through the bottom of the garden onto the legs of a person sitting in a wheelchair beneath the bed. 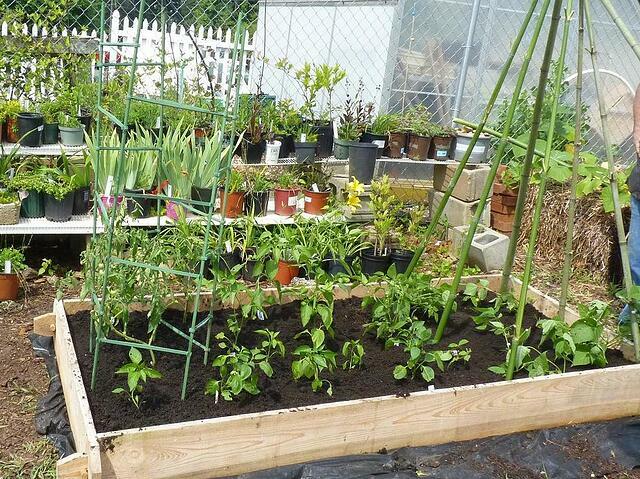 One student contributed a tall structure on wheels that allowed the raised bed to contain three individual sections. Then, another student decided to add a lazy Susan element to make all sides of one section bed easily accessible without navigating around it. 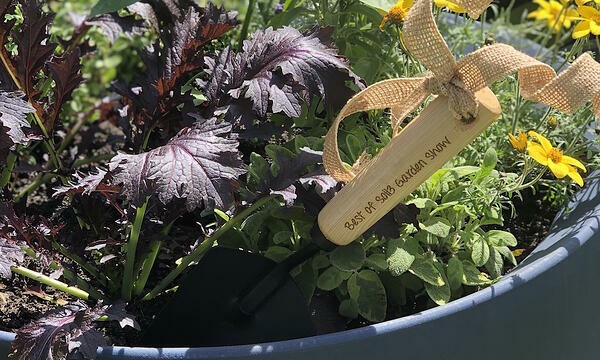 The three sections each contained a different type of garden – a sensory garden from the mind of the occupational therapist in the class, a flower garden for admiring colors, and a vegetable garden section for edible plants. This innovation captured the hearts of the judges based on its creativity and construction, and Lanier Tech took home the runner-up prize along with funds for their horticulture club. Mike Arnold and his wife Deborah brought a unique perspective to the garden show with their hügelkultur German-style raised bed garden. 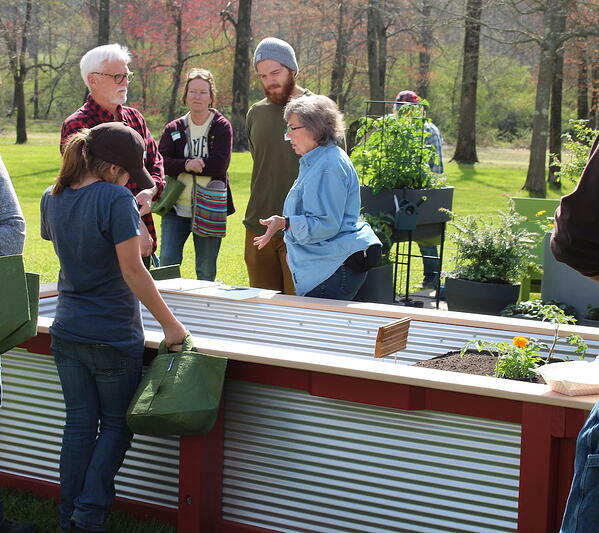 After constructing test beds for his own garden, Mike decided to enter the show and teach attendees about this method. 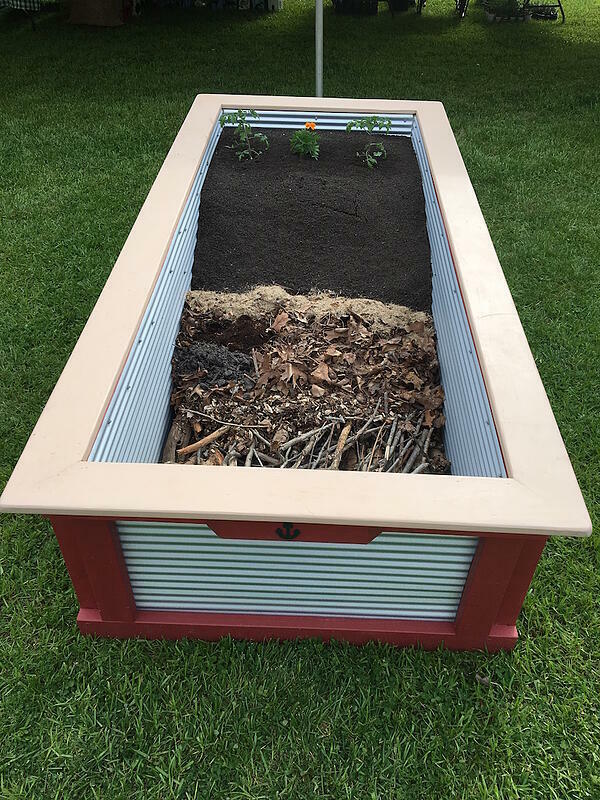 Mike’s bed was made of metal and wood and constructed so that compost touched only metal, never the wood, thus extending the life of the raised bed. However, the most impressive portion of the bed was the material inside. The hügelkultur method of no-dig gardening includes layers of natural materials that increase fertility to your garden. 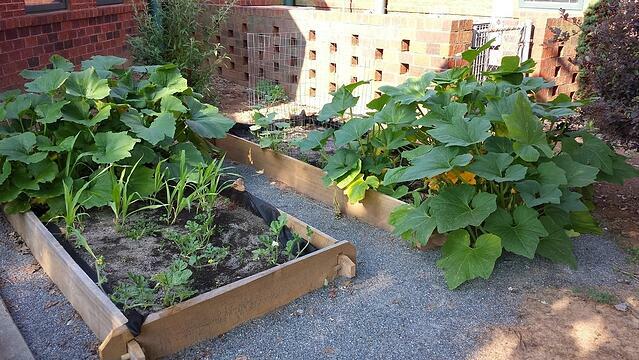 The bottom layer in this garden is made of sticks or logs, the second layer is made of mulched leaves. 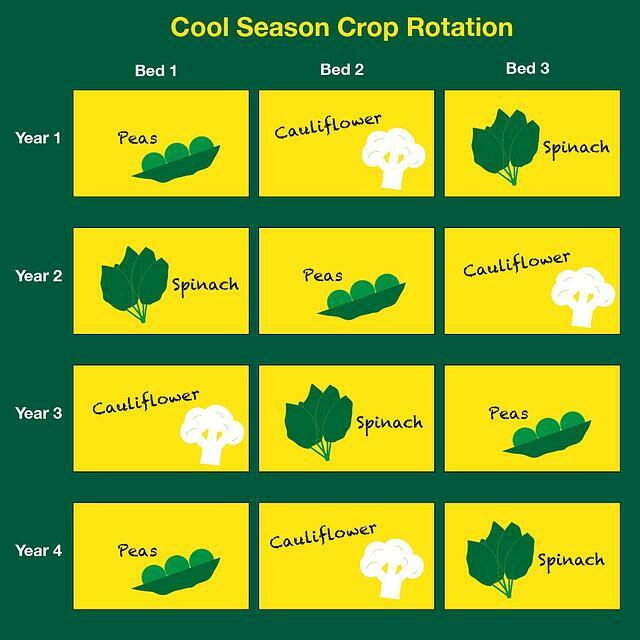 Atop of the leaves is a layer of wheat straw, followed by the final layer of well-aged compost such as Soil3. 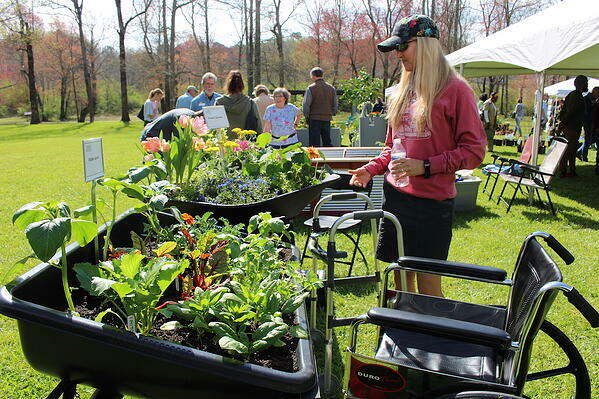 With their bed, the Arnolds successfully educated Garden Show attendees about hügelkultur and won over the crowd. 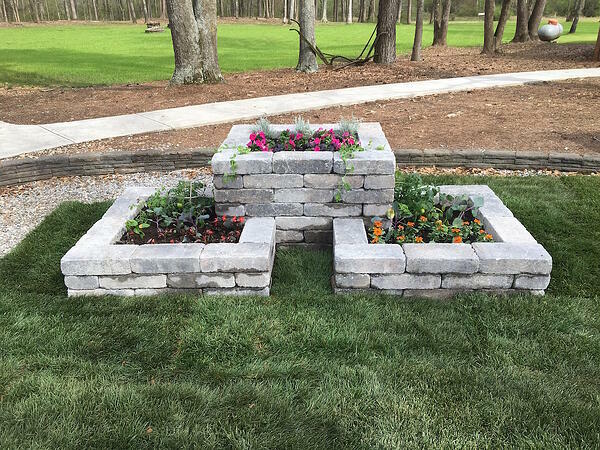 Marlon Gomez and his team of professional hardscapers at AMG Construction and Landscaping displayed their skill at the Garden Show by constructing a three-part raised bed vegetable garden built completely out of Keystone blocks. 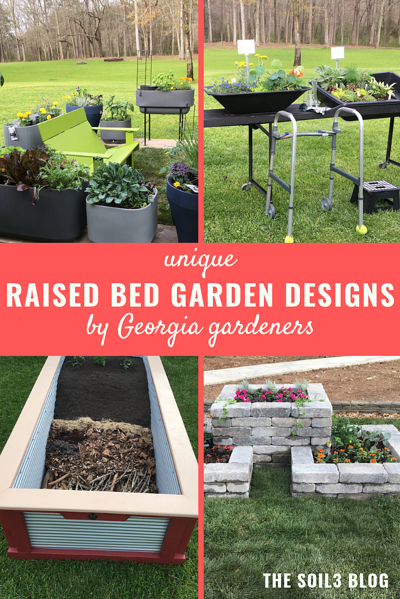 This bed showed how the average homeowner can incorporate a raised bed into a space that’s extremely versatile for either vegetable or ornamental planting. 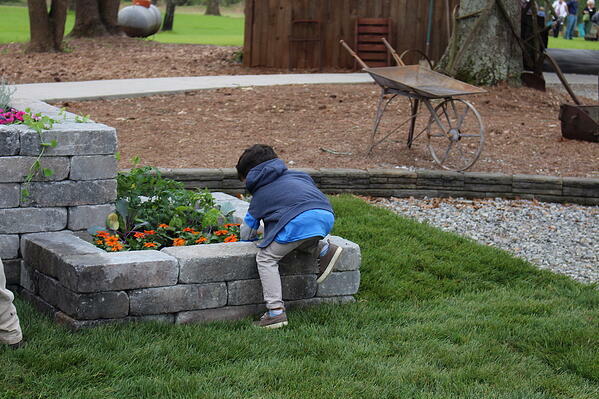 With no mortar in this design, these multi-level raised beds are perfect for kids who want to help in the garden and fit perfectly in a corner of your yard. The AMG Landscapes crew impressed judges with their incorporation of quality materials and longstanding construction potential. 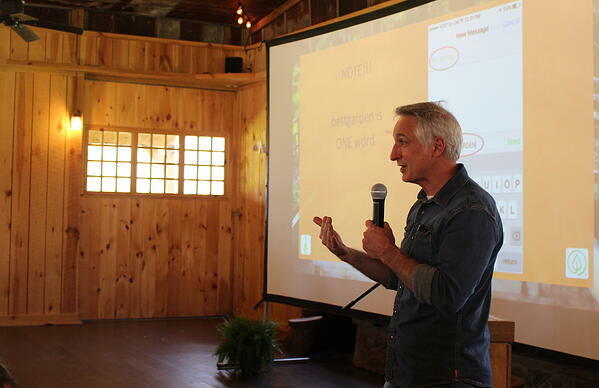 In a commitment to education for gardeners both old and new, we asked some of our favorite horticulture experts to come speak at the Soil3 Garden Show. 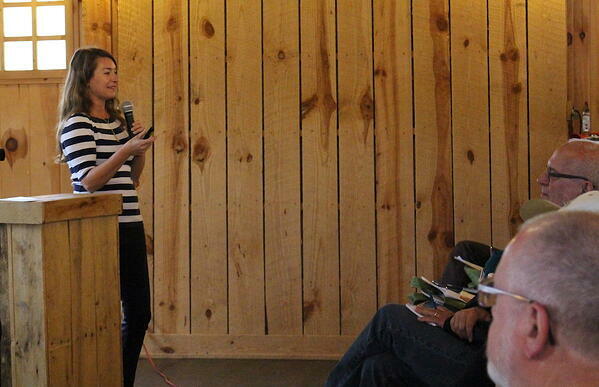 We heard presentations from Brie Arthur, Joe Lamp’l, and Ellen Honeycutt. These speakers also served as our judges. Read up on the judge qualifications in their biographies. We did have one change in schedule. Katy Ross from Night Song Native Plant Nursery was scheduled to speak, but her new baby, Sylas, made an early entrance into the world. 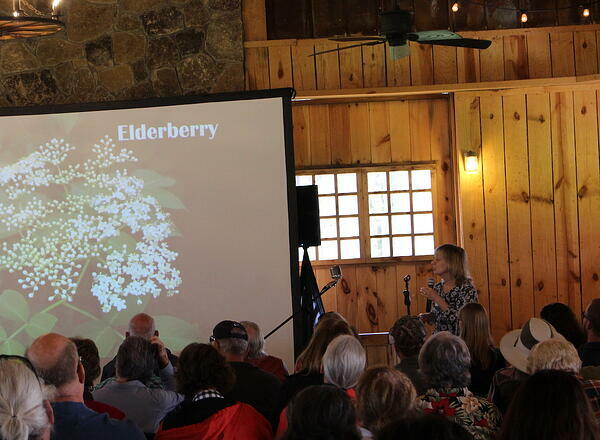 Thankfully Katy’s friend Ellen Honeycutt, also a Georgia native plant expert and blogger, stepped in to help and give the presentation on edible native plants. 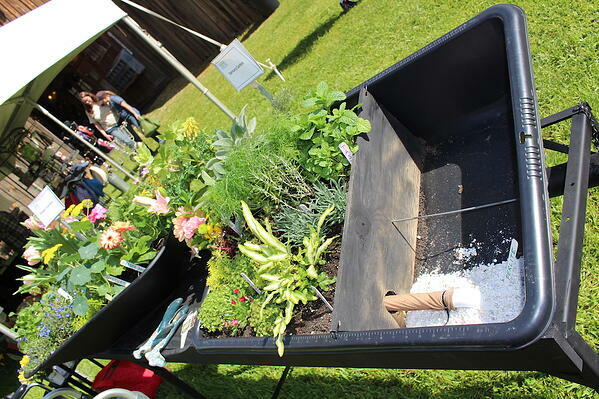 Last but not least, thank you to the crew at the Soil3 Garden Show that made the event a success! From set-up to parking to taking orders for BigYellowBags of Soil3, the team worked tirelessly during the days leading up to the show to make the event a success. Here’s a photo of the in-person team that made the Garden Show happen. Thank you to Brie Arthur for making sure that we all got together for a picture!  Want to learn more about events we’re hosting or shows we’ll be attending this spring? Check our calendar!